Mission Viejo Repipe– Joe Ludlow, is not only the founder of Integrity Repipe Inc, He is also the pioneer who started the entire PEX repipe industry in the USA and continues to offer the best quality and service in copper & PEX repiping. Don’t be fooled by imitators, he is the original Mission Viejo Repipe Specialist! Our crews are Certified, Highly Trained and Experienced. We offer a Lifetime Transferable Warranty on ALL PEX- A Water Pipes and all Labor Workmanship. Repiping is full abatement of the Hot & Cold pressurized water lines in your home. Copper Pipe- Chinese made imported copper pipes were widely used during the housing market boom. Most people that choose to repipe is do to having active leaks in their copper, CPVC, or galvanized plumbing systems that could or have caused expensive damage to their homes or possibly their neighbors have had water damage from their copper, CPVC, or galvanized plumbing system and they repipe to prevent a similar issue from happing to them. If you have a small leak in your copper, CPVC, or galvanized plumbing system you have two options repair or repipe? Yes you can repair the leak to avoid the cost of a full home repipe, but it is more likely that you have to keep paying for more and more repairs in that copper, CPVC, or galvanized plumbing system. It is a better option to PEX repipe your entire home to avoid the repeated cost of repair after repair. Correctly done PEX repipes will eliminate low water pressure, brown or rusty water and provide better tasting water! What Does A Copper Repipe Cost In Mission Viejo, CA? The price for copper Mission Viejo repipe, CA will vary depending on the size and type of home, but the average for a 2 bathroom home is $5500- $7000. What Does A PEX Repipe Cost In Mission Viejo, CA? The price for PEX Mission Viejo repipe, CA will vary depending on the size and type of home, but the average for a 2 bathroom home is $4000- $5000. That is including the repipe to the drywall and texture repair. With NO Hidden Fees or Taxes! Integrity Repipe’s highly trained technicians use non-invasive leak detection equipment (ultrasonic electronic meters, thermal imaging, infrared thermometer and acoustic sensors) to accurately locate the leak to save time, money and avoid unnecessary property damage. 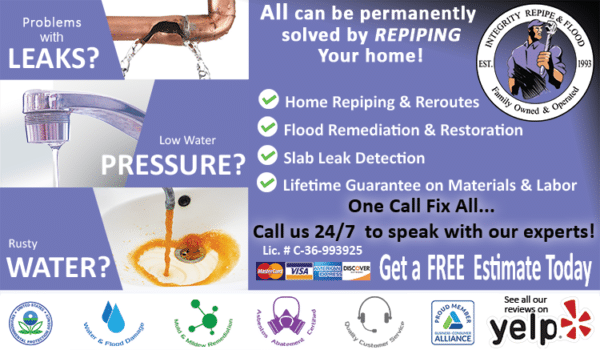 Call us for all your copper & PEX Mission Viejo repipe!